The Apollo engine is housed by a Twin Spar style steel frame which was specially developed to deliver first class ride and handling performances. Pure Apollo/Orion Through And Through. The Apollo Ultra Big Wheel is loaded with features, especially for such an affordable bike: front and rear disc brakes, Twin-Spar Tubular Frame, Pro-quality rear Rear Swing-Arm, Front Inverted Forks suspension, powerful 125cc engine with a broad powerband. But there's something more, and it's important: Nobody else can touch Honda's reputation for build quality, reliability and long-term value. After all, a fun bike is only fun if it's reliable, and you can bet that's one feature your new CRF125F Big Wheel will offer in spades. When it comes to the Apollo ULtra Big Wheel, it provides top performance and it built rock solid. It�? ?s loaded with features, because it�? ?s an Apollo it�? ?s also reliable, because riding should be a lot more fun than dealing with a poor-quality bike. The Apollo Ultra Big Wheel version offers a four-speed transmission gives you all the control in any riding conditions. The Apollo's frame is a twin-spar tubular steel frame with truss structures, optimizing the relationship between size and strength. 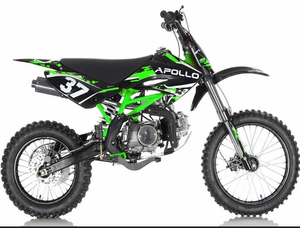 This Apollo 125cc comes with Oversize Tires, Front-17"/rear-14"
SWINGARM - The Rugged swingarm has been developed for minimum weight with optimum stiffness and precisely defined flexibility. Apollo engineers have revised the swingarm for higher functional reliability, while simultaneously reducing the weight. TRIPLE CLAMPS - High quality, CNC-machined triple clamps have long been standard equipment from Apollo/Orion. They provide precise handling and provide responsiveness of the telescopic fork. FRAME - The frame design of this Apollo model is Twin-Spar Tubular, comprising lightweight, high strength, steel section tubes, combines maximum stiffness for optimum performance. All combines for easy handling and precise steering, as well as excellent ride stability. SUSPENSION/DAMPING - Both the rear shock absorber and the inverted front fork system provide ultimate damping and responsiveness. Thanks to optimised tuning, the telescopic fork excels in preformance and limits bottoming out. Naturally, rebound and compression damping can be adapted individually to the track and rider in no time at all �?? while high and low-speed compression damping can also be adjusted on the rear shock absorber. WHEELS - The wheels feature CNC-machined hubs, high-end rims and coated spokes with lightweight aluminium, allowing the highest levels of stability to be achieved while keeping weight to a minimum. The fitted MX Mid Soft tires excel with perfect traction and outstanding performance. BRAKES High-tech brakes have always been standard equipment on Apollo offroad bikes and, together with the lightweight front & rear Hydraulic disc brakes, they are tops in brake technology. ENGINE -The engine on the Apollo/Orion 125CC is a 4-Stroke Single cylinder Air cooled engine that has been improved with a redesigned performance Carb and now boasts even better responsiveness. The carburetor setting has been adjusted and the piston pattern optimized for greater durability. HANDLEBAR - All Apollo models are equipped with the extremely sturdy, tapered handlebars that is designed to meet the demands of Trail and motocross. In accordance with the proven KTM standard, the handlebar can be fixed in a choice of four positions. SEAT - The ergonomically designed seat is equipped with an improved foam core for the this model, ensuring both greater comfort and higher stability. 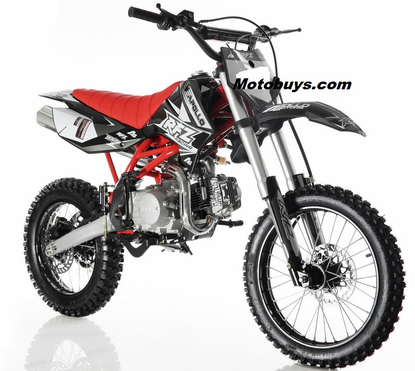 Adjustable Rear Shock: APOLLO 125cc 4 Speed Dirt Bike comes with an upgraded adjustable rear shock. CDI Ignition System: APOLLO 4 Speed Dirt Bike is also equipped with a CDI ignition system. APOLLO Decal: Features original decals that are professionally designed to give it a professional look. Upgraded Alloy Rims: Lightweight ALLOY RIMS gives this dirt/pit bike perfect maneuverability. Upgraded Alloy Handle Bar, Cross Bar, & Triple Tree: All bars on this kids dirt bike have also been upgraded to the alumium alloy for a stronger and more lightweight dirt bike. Upgraded Alloy Exhaust & Brake Lever Tip: Upgraded with an alloy exhaust and brake lever tip. Heavy Duty Chain and Sprocket: Equipped with a heavy duty chain and sprocket. This heavy duty chain and performance sprocket work together for the highest durability in this pit bike. Transmission: 4-Speed 1-down, 3-up, 4-speed manual transmission. 125cc 4-Stroke Engine: 9 horsepower and has a 50 MPH+ speed capability*. Dual Hydraulic Disc Brakes: For the ultimate in stopping power. 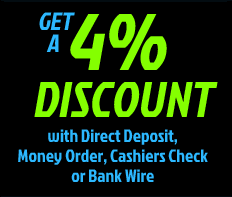 ALL FREE STUFF when you buy a powersports vehicle from us! 1. Free Shipping on all vehicles! 4. Free 1 Year Manufacture Warranty! Click here for full details. 8. Free MSO for vehicle registration. Orion understands the importance of proper frame geometry, precision tolerances and use of metals that provide the highest quality and materials that provide you the best performance. Orion takes pride in the fit and finish of every Apollo product and always makes sure that function comes first. Fabrication of Apollo bikes and the parts is the # 1 priority of our business and to this day our passion lies in the thrill of riding. Orion's goal is to continue to build great products that maintain that same kind of fun factor. We are excited about our new products and hope they add some passion to your bike. Whether its winning a national event or just riding with your buddies, Apollo has you covered. For all those who love to ride as much as we do. * Graphics decals are updated by the factory on a regular basis. Motobuys does not guarantee any exact custom decal design on this model.